This text by JOHN WANZEL is published alongside MONA KAMAL’s Journeys. Mona Kamal’s Journeys is an exhibition of collection and reassembly an articulation of years of experiences and travels that have been shipped, shifted and recombined. Kamal has conserved physical and conceptual mementos from her trips to India and Pakistan and reconstituted them alongside material reflections of her past in Canada as well as her current life in New York City. She recontextualizes her journeys and experiences, translating them into publicly and personally legible forms. These forms are at once a combination of separate journeys, separate experiences, and an investigation of their mutual relationships. They re-present familiar materials beyond their own construction and intention. Her art creates a material language that explores the interconnection of substance and memory, culture and context. In language, the letter is the smallest form that carries meaning. Words arrange letters, which then blossom into sentences, perpetuating significatory production and reproduction throughout and beyond ever-expanding texts. In the act of translation, letters and words multiply this production of meaning, accruing connotations as they slip between one culture, one language, and the next. Meaning may appear transitory, but the cultures behind words leave a permanent trace; they can never be fully extracted from their languages. Such issues of inter-cultural communication are crystallized in Kamal’s “Fragments” and “Empty Boxes,” which becomes the terrain where the translation of experience, language, culture, and memory takes place. The objects used in this physical act are reduced and purified, as if the process of reconstitution itself has alchemical properties. 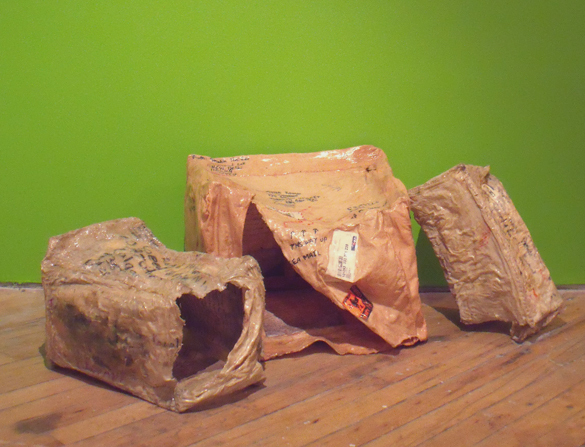 The skins of boxes trace on their surface their path from India to Canada. Artifacts from two trips separated in time by ten years, they mark two different journeys, two different sets of boxes sent from one cultural site to another. Kamal’s “Empty Boxes” takes as its foundation an antiquated Indian postal regulation requiring all mailed packages to be covered with cloth and sealed with wax. Here, that cloth and its seal have been transformed into shell-like castings, delicate and eerily preserved. The boxes’ shells bear written markers of their lives, tattooed with their origin and stamped with a future destination; cultural pasts transported to the new world are toughened by their journey. Transformed, they suggest husks of long-decayed fruits preserving their voids for the lost, missing, and precious. And indeed, we find tucked away inside these tattooed husks reproductions of letters from Kamal’s grandfather to his son, her father. Written mostly in her grandfather’s native script, Urdu, these letters mark the standardized register of Hindustani used in Pakistan and Northern India both a generation ago and today. Folded and recondite, the letters’ placement keeps their meaning concealed, defying the viewers’ attempts to probe their messages. Only the husk itself, and perhaps a determined Urdu-speaking observer, can witness the personal correspondence between father and son. The private histories of these personal relationships, much like the interiors of the husks that they are housed in, close themselves off from open disclosure. Those hardened, marked exteriors exist both in opposition to their more elusive contents and in the service of their very preservation. Bringing these two items together, the boxes and their contents, is a way of re-shipping messages and meanings to a new world. The husk and letters suggest a physical vessel of past experience, but at the same time this act of preservation seems to defy any attempt at adaptation. To the outsider, they are treasure maps without decoder rings, unsignified signifiers. They are family history, they are cultural history and as such, they resist full translation. The letters and their secrets are left, like the husks they are attached to, preserved and unassimilated. This formal elaboration of the materials’ transformation beyond the limits of their own physical existence is most apparent in Fragments. Here Kamal stacks bits of accumulated cultural experience; carefully selected objects in a deliberate cumulative form. The act of stacking also layers meanings implicitly calling on the viewer to add meaning, to complete the arrangement. Layers create mirrors, layered history: where red sand made from the bricks used in traditional Indian houses is brought back to Canada, then transported to New York, only to be used in an exhibit in Canada. Birch bark and branches covered in Oregon Moss complete the synthesis of personal history, memory and material; the bark was historically employed as writing tablets by the First Nation, while the branches themselves evoke the West, the mountains of British Columbia. Though doubtlessly inflected by the evidence of one fraught embattled cultural past, the work itself is non-polemic; it opens itself up, it calls out for signification. It is ready to be pieced together. The reduction and arrangement of these simple natural objects weave together our own culture, experiences, and object relationships. By taking the materials away from their surroundings and presenting them in a decontextualized state, the work becomes a moment of granulation, breaking its parts down to their smallest states of significance, even as they are reconstituted in a new, layered form. The objects’ language is fluid, it seeps into the viewer’s own perspective, inviting him to recontextualize and reconstitute his own past experience. Kamal’s exploration of materials, and their meaning-creation, is filled as is any search for the essential with the debris of modern life. Kamal acknowledges the detritus that fills our day-to-day experience as well as our desire to leave it all behind, to transcend our lived social existence. “Painted Tree” and “Concrete Tree” speak to the commingling of the simple, organic material of nature and the commodity-driven, globally connected contemporary social condition. While clearly existing within the context of late capitalism, Kamal’s synthetically organic arboreal forms are living and thriving amid the havoc; they hold out the possibility that the essential, the (always fraught) authentic, can survive its own commodification. Short, thin, and fragile, the pair of trees’ size is a human size; their struggle is a human struggle. Their physicality connects to the viewer’s own physicality, as we see our own oil-drenched feet alongside their roots, solidly planted in the rubble. Periods of ostensible decay and loss, of deconstructions both global and minute, can also lay paths to rebuilding to the opportunity to reconstitute our worlds anew. Perhaps, in these spaces of transition, personal history and cultural history can be recombined so that the minutia of language can survive across gulfs that separate past and present, them and us. In the magnification of our material experience, in the determined pursuit of the essential, we can learn from minutia, detritus, and fragments. We can look to empty boxes, red sand, birch bark, and branches and find that sometimes preservation means leaving it all behind. JOHN WANZEL is an artist, writer, and radio producer. His sound work and visual art have been presented in a number of festivals, galleries, museums, websites, and broadcasts including: The Museum of Contemporary Art Chicago, Dogmatic Gallery (Chicago), Deadtech (Chicago), Space Gallery (Pittsburgh), The Outer Ear Festival of Sound (Chicago), Pulse Field (Atlanta), UbuWeb, and has toured nationally and abroad as part of a Temporary Services project. Most recently, he participated in a Neighborhood Public Radio project with the 2008 Whitney Biennial. His work for radio has been played through out the United States, Europe, and Canada. Wanzel has also worked in galleries and museums and at a number of academic institutions, including the School of Visual Arts, The School of the Art Institute of Chicago, and the Smart Museum of Art at The University of Chicago. Wanzel lives in Brooklyn, NY.